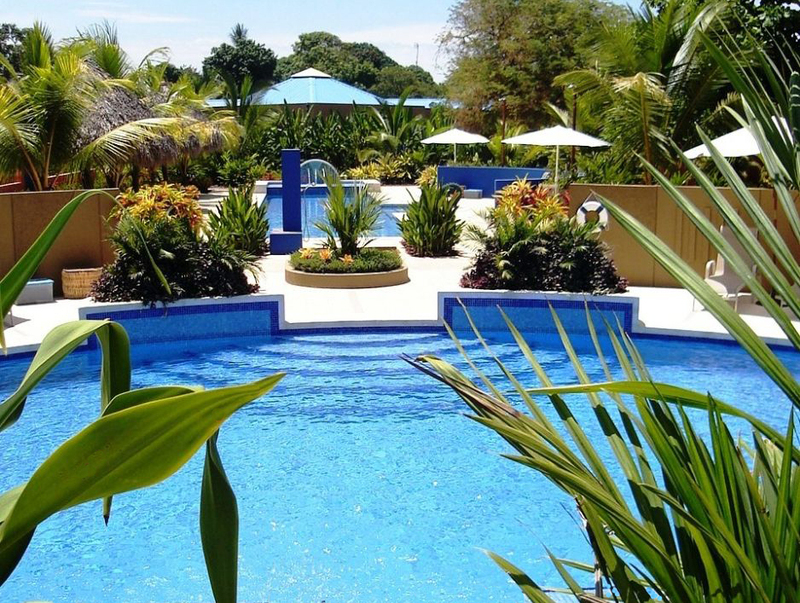 Located on the beach along beautiful Playa Esterillo Este, in Costa Rica's breathtaking Central Pacific region, our 4 Star international hotel is the ultimate seaside escape. The sun-splashed beach, glistening ocean waves and steep verdant cliffs create an awe-inspiring landscape against the unique pastel villas of Alma del Pacifico. Lovely walking paths lead through colorful ornamental, herb and vegetable gardens to your oasis bungalow. And the incredible wildlife (including multitudes of endangered scarlet macaws, butterflies, iguanas and lizards) brings Costa Rica's natural wonders right to your doorstep. 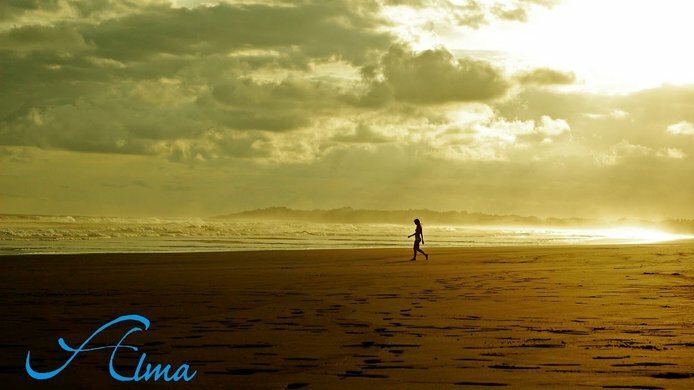 In addition to its unmatched location and spectacular natural environment, Alma Del Pacifico Beach Hotel & Spa features original art – over 150 works – throughout the resort by world-renowned artist Charlene Broudy who now resides in Santa Barabara California and maintains her own art gallery there. Charlene and her husband, architect Sherrill Broudy, created the Alma with the intent that guests would be immersed not only in nature but also art and design. The villas also include an array of wonderful on-site amenities. The open-air, thatched-palm restaurant and bar has sweeping views of the beach and gardens from every table. Featuring gourmet international and Costa Rican dishes, it emphasizes fresh seafood and produce, with many fruits, vegetables and herbs grown in the hotel's own gardens. The hotel's lovely seaside spa offers an extensive menu of therapies that incorporate organic local ingredients, and treatments rooms that open onto private tropical gardens. 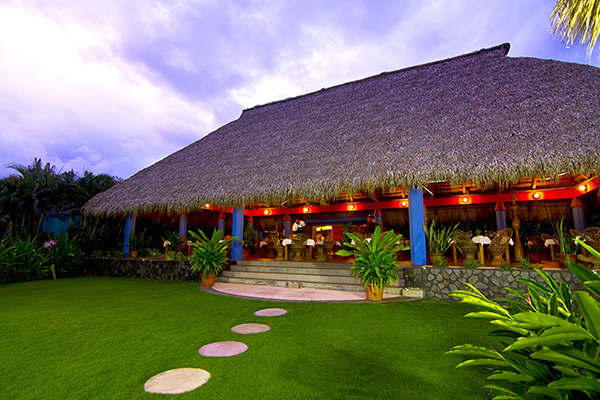 The intimate and luxurious rooms at Alma del Pacifico were designed to reflect Costa Rica's colorful culture. Each room features a large private terrace with sweeping views of the Pacific Ocean or Alma's lush tropical gardens. The spacious bathrooms are highlighted by a mosaic-tiled shower that opens to a private garden. Designed by architect Sherrill Broudy, with original paintings, mosaics and tapestries by artist Charlene Broudy, Alma del Pacifico's villa rentals are sure to be some of the most unique, colorful and luxurious accommodations in Costa Rica that you have ever seen. Alma Del Pacifico Beach Hotel & Spa is located between the towns of Jaco Beach and Quepos, and is just an hour and a half drive from San Jose International Airport.